Richard is currently involved in a Kickstarter project to get the Dover Boat replica sea worthy, have a look at the project on the Current Projects page. Richard Darrah is an archaeologist who specialises in ancient timber. 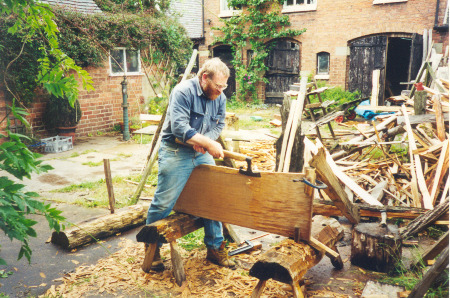 His main interests lie in studying excavated timber, doing reconstructions using ancient techniques and working with cleft oak. He has worked on excavations from the Neolithic to the Medieval periods and has worked on reconstructions of objects from Anglo-Saxon beds, looms and shields, to Bronze Age boats and Viking Buildings. This sort of experimental archaeology is described on Wikipedia. Richard was involved in his first archaeological dig in 1962 at the age of 13 and has never looked back. Between 1975 and 1993 he worked reconstructing Anglo-Saxon houses and as a warden for West Stow Anglo-Saxon village. Since then he has been self-employed, trading as Riven Oak. This has allowed him to work on a wide variety of projects. He is currently working on a number of new projects including the reconstruction of a Bronze Age boat. This is a collection of just some of his work. Please feel free to contact Richard if you would like any more information.